Loews Hotels & Co., The Cordish Companies, And The Texas Rangers Unveil Vision For $150 Million Flagship Hotel At Texas Live! ARLINGTON, Texas, May 4, 2017 /PRNewswire/ -- Loews Hotels & Co., The Cordish Companies, and the Texas Rangers announced their vision today for the hotel and convention center at Texas Live!, the $250 million world-class dining, entertainment and hospitality destination being developed in partnership between The Cordish Companies, Texas Rangers and City of Arlington in Arlington, TX. The new $150 million flagship hotel, Live! by Loews – Arlington, TX, will be the first of its kind in the country, providing guests an unprecedented upscale experience that blends sports and entertainment with first-class hospitality and superior amenities. Texas Live!, anchored by Live! by Loews, is a part of a $4 billion vision for the Arlington Entertainment District that includes the Rangers new $1 billion ballpark and preservation of Globe Life Park. Ideally positioned between the Texas Rangers' Globe Life Park and the Dallas Cowboys' AT&T Stadium, the project will become a resort-style destination for sports fans, visitors, and families, as well as a spectacular location for meetings, special events and conventions. "The Cordish Companies and the Texas Rangers are two world-class organizations with an incredible vision for the Arlington Entertainment District that is highlighted by their commitment to quality of design and architecture," stated Jonathan Tisch, Chairman and CEO of Loews Hotels & Co. "This partnership allows us the opportunity to bring Loews Hotels back to Texas after a more than 20 year hiatus and presents what we plan is the first of several new hotels under the Live! by Loews partner brand." Welcoming guests for nearly six decades, Loews Hotels & Co.'s core brand, Loews Hotels, has become a leader in distinctive hotels that cater to meetings and groups, business, leisure, and family travelers in key urban and resort destinations throughout the United States and Canada. The Cordish Companies' Live! brand, one of the premier entertainment brands in the country, welcomes over 50 million annual visitors to its Live! Districts which are among the highest profile dining, entertainment and hospitality destinations in the country. Together, these two powerhouses will provide a one-of-a-kind upscale destination for the City of Arlington and the Dallas Fort-Worth metroplex. "Loews Hotels & Co. brings a first-class level of hospitality that is unmatched," stated Blake Cordish, Vice President of The Cordish Companies. "Live! by Loews will debut on one of the highest and most exciting platforms of sports and entertainment in the entire country. Live! 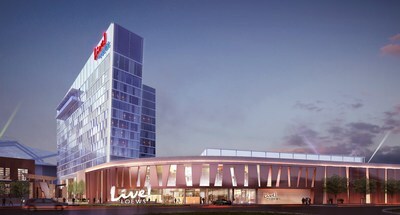 by Loews is a major step forward in cementing Arlington as the premier entertainment destination in the State of Texas." "An upscale hotel in the Entertainment District has long been a dream for Arlington and we couldn't be more excited to see that dream become a reality with the addition of a Loews branded hotel," said Arlington Mayor Jeff Williams. "With this announcement, we have just combined three world-class businesses with a world-class destination. This is a home run for Arlington and its residents and visitors." Tower Terrace and Event Lawn: Located within a 40' tall by 60' wide veranda-style cutout through the hotel tower, the Tower Terrace is one of the most unique spaces in the entire project. The casual, but sophisticated space will serve as the ideal place to relax with family and friends or enjoy a cocktail. The space overlooks a beautiful multi-use Event Lawn perfect for weddings, special events and community gatherings with incredible views of the entertainment district. The Event Lawn also features a cutting-edge LED screen for unparalleled sports viewing, movies and concerts. A truly unique experience, the Tower Terrace and Event Lawn at Live! by Loews will serve at the hotel's central gathering place and become one of the country's most desired places for special events. Outdoor Infinity Edge Pool: Located adjacent to the Tower Terrace and directly next to the Event Lawn, guests will be able to enjoy the same stunning views of the entertainment district from the pool area, as well as the same immersive A/V experience. Dually designed to accommodate both high energy and relaxation, the pool area at Live! by Loews will be welcoming for all guests. The resort-quality pool area will feature two bars, including a swim up bar, rentable private cabanas, ample comfortable lounge space and a fire pit. Rooftop Terrace Private Event Space: Boasting panoramic views unlike any other of the Dallas and Fort-Worth skylines and Arlington Entertainment District, the Rooftop Terrace will feature several private event rooms, as well as a central main space for private functions and events. Once complete, the Rooftop Terrace will be one of the most spectacular special events venues in the region. Revolver Brewing Brewery, Bar and Tasting room: Known for bringing a fresh perspective in world-class craft beer in the Dallas/Forth Worth region, Revolver Brewing will be opening a working brewery, bar and tasting room where guests can enjoy Revolver's flagship brands, like Blood and Honey, as well as one-of-a-kind specialty beers specifically crafted for the stadium district. "Live! by Loews will anchor Texas Live! as one of the premier entertainment, hospitality and event destinations in the country," stated Rob Matwick, Executive Vice President of Business Operations for the Texas Rangers. "We are very excited to announce our partnership with Loews Hotels and to unveil our vision for Texas Live! together with our development partners, The Cordish Companies." Texas Live! is expected to create approximately 3,025 new jobs for the City of Arlington and Tarrant County, including 2,000 construction jobs and 1,025 permanent jobs, along with numerous vendor opportunities for local, minority, women and veteran-owned businesses. The dining and entertainment space in the district will open in 2018, with Live! by Loews scheduled to open in 2019. For more information, please visitwww.texas-live.com. Headquartered in New York City, Loews Hotels & Co. hospitality company is rooted in deep heritage in the hotel industry and excellence in service. The hospitality group encompasses branded independent Loews Hotels, and a solid mix of partner-brand hotels. Loews Hotels & Co. owns and/or operates 24 hotels and resorts across the U.S. and Canada, including Hotel 1000 in downtown Seattle and the Loews Sapphire Falls Resort at Universal Orlando, the fifth hotel in partnership with Comcast NBC Universal. Located in major city centers and resort destinations from coast to coast, the Loews Hotels portfolio features properties grounded in family heritage and dedicated delivering unscripted guest moments all with a handcrafted approach. For reservations or more information about Loews Hotels, call 1-800-23-LOEWS or visit: www.loewshotels.com. The Cordish Companies' origins date back to 1910 and encompass four generations of privately-held, family ownership. During the past ten decades, The Cordish Companies has grown into a global leader in Real Estate Development, Gaming & Hospitality, Entertainment Management and International Urban Planning & Development. One of the largest and most respected developers in the world, The Cordish Companies has been awarded an unprecedented seven Urban Land Institute Awards for Excellence for public-private developments that are of unique significance to the cities in which they are located. Prime examples are The Cordish Companies' prominent role in the redevelopment of Baltimore's world famous Inner Harbor; Philadelphia, PA; Atlantic City, NJ; Charleston, SC; Houston, TX; Louisville, KY; Kansas City, MO and St. Louis, MO. In addition, The Cordish Companies has developed and operates multiple highly acclaimed entertainment destinations throughout the United States which welcome over 50 million visitors per year and are the most visited destinations in their respective regions. Over the generations, The Cordish Companies has remained true to the family's core values of quality, entrepreneurial spirit, long-term personal relationships and integrity. As a testimony to the long-term vision of its family leadership, The Cordish Companies still owns and manages virtually every business it has created. For more information visit www.cordish.com or follow us on Twitter (@cordishco). Entering their 46th season in Arlington, the Texas Rangers play in Major League Baseball's American League West Division. The Rangers own seven A.L. West Division titles (1996; 1998; 1999; 2010; 2011; 2015; 2016) and have advanced to postseason play in five of the last seven seasons. Texas has won at least 87 games in seven of the last eight years beginning 2009, the only Major League team to make that claim. A community leader, the Rangers, through the work of their Baseball Foundation, are dedicated to improving the lives of children in need and providing funding for youth in crisis, youth health initiatives, youth baseball programs, and youth education. Celebrating its 26th year, the Foundation has given back more than $15 million to help children in need.